We’re pleased to share that SeamSAFE Roof Anchors are showcased on the cover of the latest edition of Metal Roofing magazine, which comes out in April 2017. 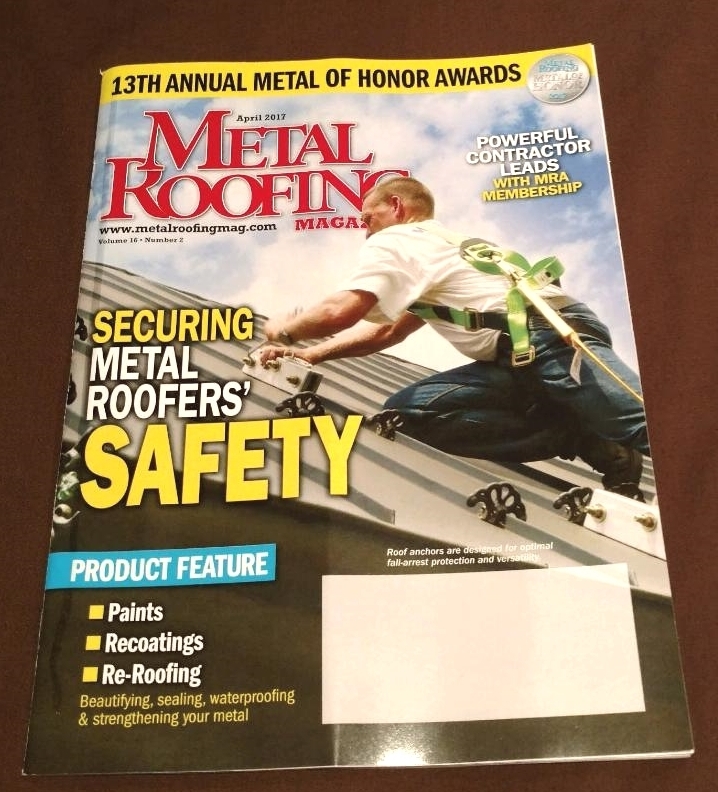 We are honored that our company was featured in this key issue that covers the vital topic of roofer safety. The magazine’s editorial included results from the latest independent testing of the holding strength of SeamSAFE anchors. Based on the results, our safety anchors are now certified to support 10,500 pounds of weight. This puts our brand in the leadership position for gripping power relative to other safety anchors for standing seam metal roofers. In addition to focusing on SeamSAFE anchors, Metal Roofing covered the attributes of our versatile roof brackets and new mounting adapters. SeamSAFE Mounting Adapters are designed to be paired with our anchors for reliable mounting of a full range of rooftop equipment. This includes securing large HVAC units, industrial piping, walk boards, solar panels, satellite dishes, handrail systems, and other apparatus to standing seam roofs. Our anchors can also be used in tandem with specially designed SeamSAFE Roof Brackets to provide a means to easily mount a temporary rooftop walkboard for roofers to use during installations and repairs. SeamSAFE brackets also can be used to create a rooftop staging area for gear and materials. In addition, Metal Roofing magazine highlighted our company operating principles of integrity, quality and service. We apply these tenets to everything we do from product design and daily operations to how we treat our employees and service our customers. Our business objective is not to be the largest anchor distributor or outdo competitors based on sales performance. Rather, we define success for our family-run business by our ability to provide the highest caliber and most reliable fall-arrest protection available to standing seam metal roofers. To secure a copy of Metal Roofing magazine, visit the publication’s website at www.constructionmagnet.com/metal-roofing-magazine. To learn more about SeamSAFE anchors, brackets and mounting adapters, please visit www.seamsafe.com or give us a call at 855-263-1521.